Our water comes from a well. There’s no pretty stone wall with a bucket to lower via a windlass, no moss or wild violets fringing the mouth. There’s a red steel cap – that’s all. And the well is deep, drilled into granite, encased in steel for the first 20 feet to protect it from groundwater. When the guy came with the drilling rig more than 30 years ago, he told us that there were many fissures feeding into the main shaft and that, depending on the time of the year and the aquifer, our water would come to us from different levels. And it’s wonderful water. It always tastes the same – cold and wild from the tap. (I confess I can’t taste the difference from the deeper water and that coming from a source closer to the surface.) We don’t treat it. We had it tested and the results were excellent. Nothing bad, no arsenic (fairly common in our area). I’m touching wood as I write this. Reliable water – for drinking, for watering the garden, for any number of things we take for granted – is a gift. I’ve been thinking about wells and their metaphorical value lately. The work I’m trying to do is slow and kind of plodding and I’m a little concerned that I’m not actually writing from the deepest place possible. I’m not sure how to do that with this material. There’s no solution apart from patience and maybe more effort. 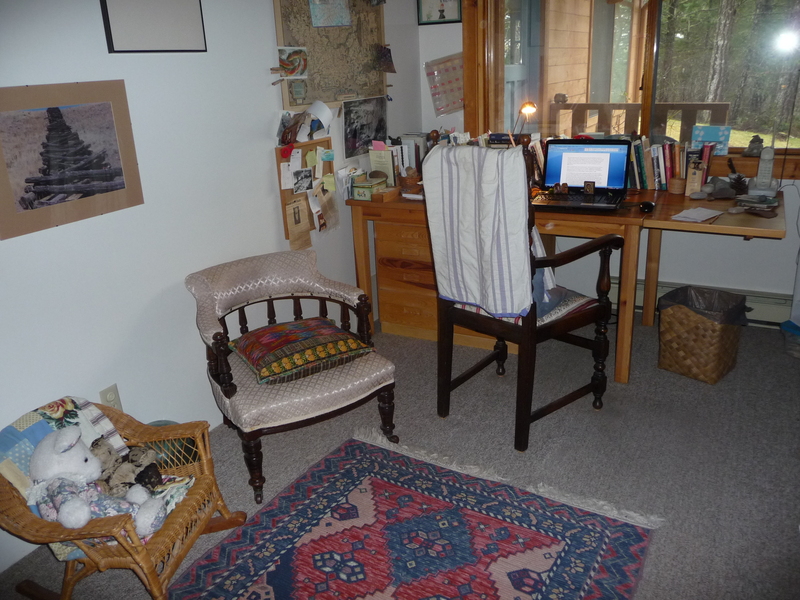 I cleaned my study, hoping that a tidy desk would be like a clean slate. And it feels good to sit here. I love my view – the woods to the south of the house and more immediately, a little porch where winter wrens (I know they’ve been reclassified as Pacific wrens but old habits die hard) come most mornings lately to search for tiny spiders in crevices between the cedar siding. I watch them move so quickly along the wood, pausing sometimes to sing. Sometimes a coyote passes the house. And elk. Yesterday I had a small bonfire of the vanities, burning old drafts of manuscripts and bits and pieces it seemed silly to keep. I’d kept them for too long and they’d gathered dust, the wrong kind of dust. Not the useful patina of history, that’s for sure. It’s timely to be reminded of the dangers of that trip to the well, hoping for the deeper water. But I’m still going to try. ~ by theresakishkan on January 15, 2014. Wanna talk about it? Let me know. That’s sweet of you, A. Will email you soon. What a beautiful room, Theresa. I love to see where other writers work. Good luck with your search. But from what I’ve read of your work – you automatically go deep deep deep. Maybe you just don’t know you’re already there. What a dreamy study! No doubt your mind is always busy creating! How could it not with a view like that! And here I am again, waiting for the winter wren! This entry was posted on January 15, 2014 at 7:59 pm and is filed under Uncategorized.You can follow any responses to this entry through the RSS 2.0 feed.You can leave a response, or trackback from your own site.